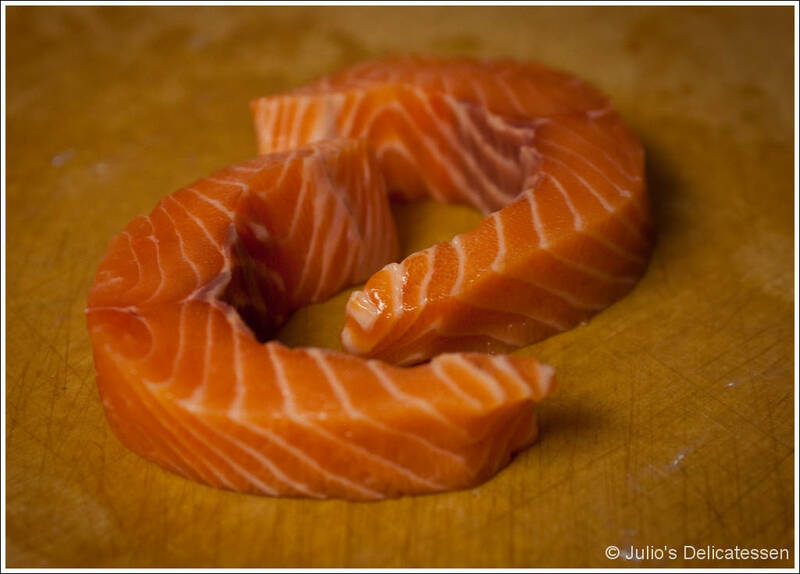 There are times when I find salmon fillets to be a shape or size that’s difficult to deal with; either they’re enormous, or they’re an awkward long-and-skinny shape. This recipe deals with that problem by tying together two small skinless fillets unto a medallion. The quick-pickled red onions really complete this dish, so I recommend giving those a a try. Heat oil in a saucepan over medium heat. Add garlic and shallot and cook until soft but not brown. Add beans, 1 cup broth, 1 tsp salt, black pepper, and white wine. Simmer for 7 – 10 minutes. Pour the bean mixture into a blender and process until it’s as smooth as you can get it. Return to saucepan over medium heat. Add chile powder and enough additional broth to make it the consistency of a cream sauce. Simmer over low for 2 – 3 minutes. Keep warm until ready to serve (or put in refrigerator for a day or two – reheat before serving). Slice red onions thinly. Place in a bowl along with juice of two limes and 1 Tb salt. Toss to coat. Place in refrigerator uncovered (so it’s easy to get in and re-toss every 30 minutes or so). Cut fish into 8 strips of equal width. Take two strips, place on their side, and make “C” shapes with the side where the skin used to be on the inside. Nest one piece inside the other as tightly as possible. Using a piece of butcher’s twine, tie the two together to form a single medallion. Repeat until you have four medallions. Preheat oven to 350. Heat 2Tb butter plus 2Tb oil in a cast iron skillet over medium-high heat. 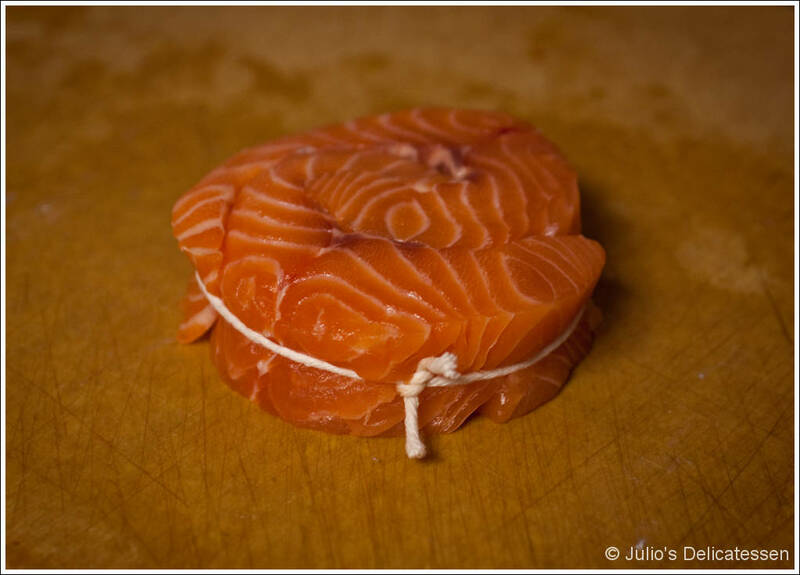 Place the salmon medallions in the skillet and cook for ~ 2 minutes per side. Flip back to the first side and move skillet to oven. Cook until fish is done, another 1 or 2 minutes. Place some rice in the middle of a dinner plate. (If you want, you can mix some minced cilantro in the cooked rice). 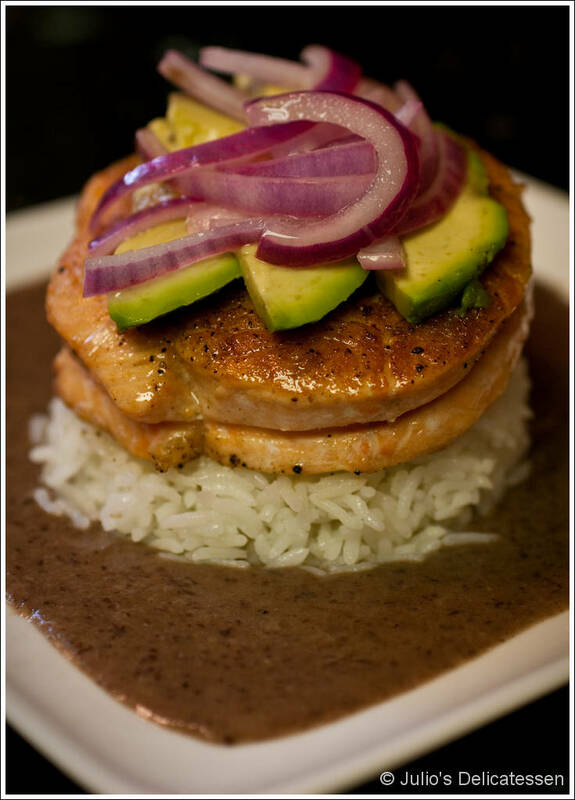 Place a salmon medallion on top of the rice. Mound some quick-pickled red onions on top of the salmon. Spoon some black bean sauce onto the plate around the outside of the salmon.